Did you know that chickpeas make a deliciously versatile, protein-packed and gluten-free flour? I’ve used it in this recipe to make the sauce, but feel free to replace it with any plain flour of your choice (the quantities remain the same). Same goes for the fish – it’s easy to replace my choice of fish with your choice of fish – whatever is local and freshly caught. Put all the fish in a big pan on the hob and pour over the milk. Bring to a slow boil and then remove from the heat and leave the fish to poach for 5-10 minutes in the hot milk until cooked through. Remove the fish from the pan with a slotted spoon and leave to cool on a plate. Decant the milk into a jug and leave to one side. Once the fish has cooled you can flake it with your hands, removing the skins or any bones that you find. Put the celeriac and carrots in a steaming pan on the hob and steam for around 10 minutes. Add the sweet potato and continue steaming for another 10 minutes until the veg are soft. In another large pan melt 80g of the butter over a medium heat on the hob. Add the chickpea flour and stir until combined. Continue to cook for 2-3 minutes. Start adding the milk to the flour mixture in small ‘batches’, stirring constantly with a wooden spoon, until combined and smooth. It should look a bit like runny custard! Add the prawns, flaked fish, chickpeas and peas to the béchamel sauce. Season with salt and pepper. Mash the root veg with the leftover 50g butter until it’s the right consistency for you (you may need to add extra butter and/or milk). Season with salt and pepper. Pour the béchamel and fish mixture into a large (approx 35x25cm) baking dish and roughly even out the surface. 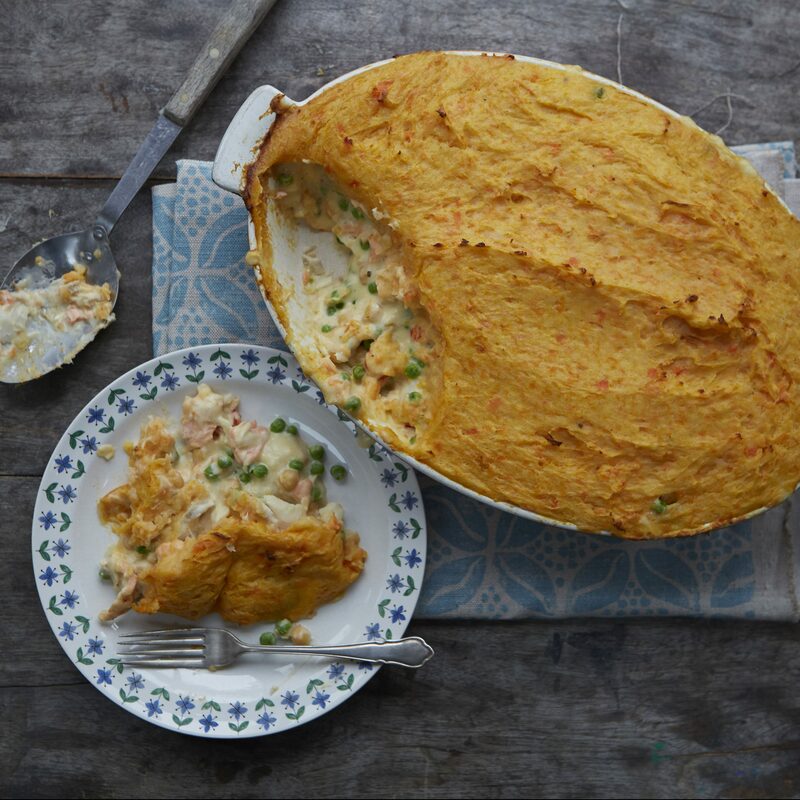 Layer the mash over the top and smooth out. Bake in the preheated oven for 25 minutes until the top is looking crispy and delicious and the sauce is bubbling at the sides. I’m not sure why, but this strikes me as a very exotic recipe! Something about the “hob” and just a fish pie in general! Thanks for this healthy recipe. 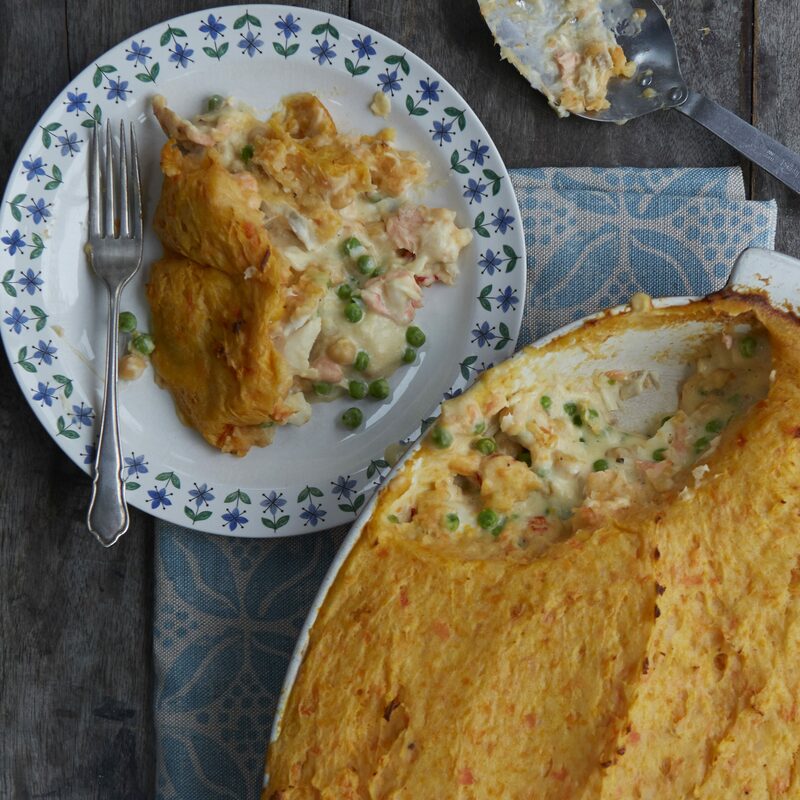 An exotic fish pie! I love that. 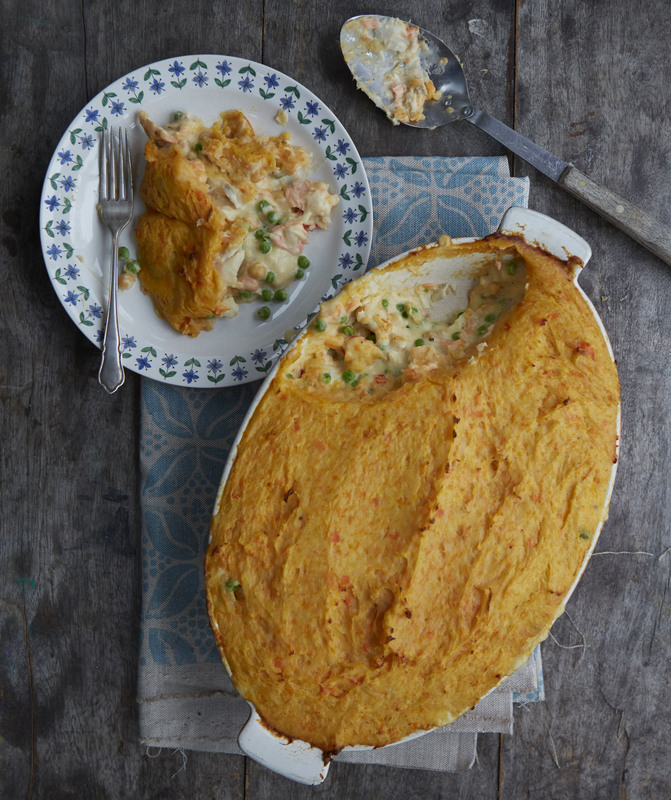 Actually, it really is a rather simple fish pie with a colourful mash! I’m intrigued by your reference to the ‘hob’ – does it mean something else to you?